Starting a blog can indeed be confusing, especially if you don’t know where to look. Thankfully, you don’t need to spend hours trying to “figure it out” and spend hours trying to search how to do it. In this step-by-step tutorial, I’m going to layout and show you exactly how to setup your own blog with a few clicks of your mouse button. Getting your own domain name, or in others words, your own .com. 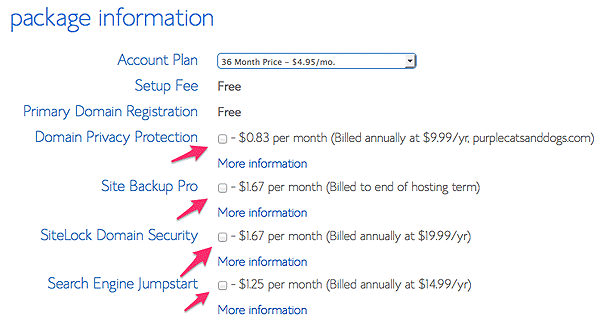 Signing up for web hosting. 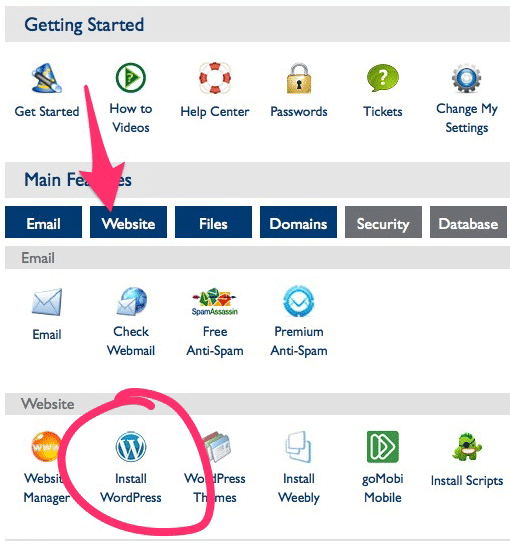 How to install your blog. 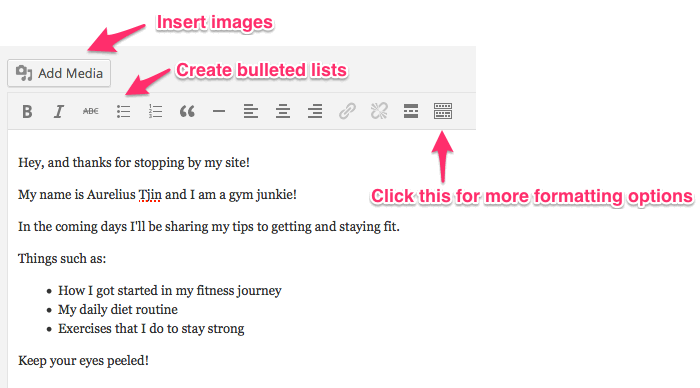 How to post your first blog post. By the end of this tutorial, you’ll have your very own blog with your first post up! 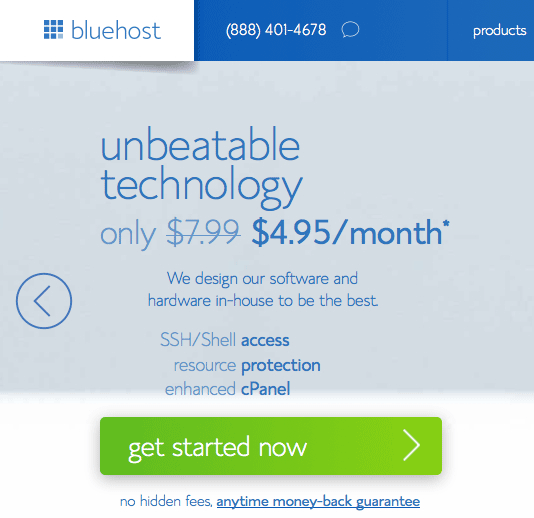 I highly recommend BlueHost web hosting (affiliate) as a web hosting provider for starters. It’s cheap and easy to use when it comes to managing your websites. Simply choose the Standard plan. It’s all you need to start out. For $4.95 a month, you can’t go wrong. This is where you can choose your own .COM. This can be the most exciting parts and at the same time, most frustrating because you’ll most likely spend a lot of time thinking of what name you should register. Besides, it is important because you’ll be telling everyone what your site is. A good domain is memorable and unique. Start by using your full name, for example, mine would be aureliustjin.com. If yours is taken, try your nickname. 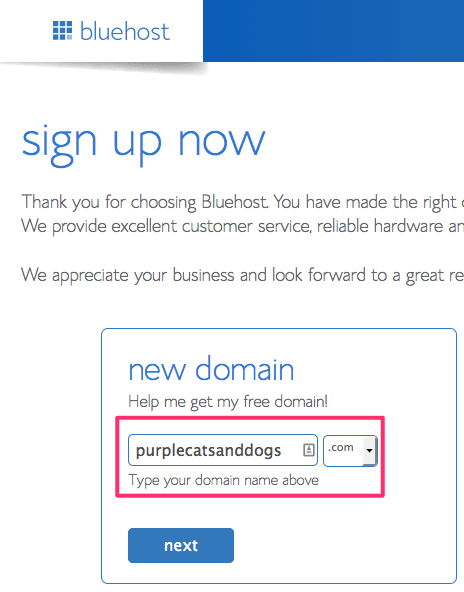 When you’re ready, make sure to insert it into the new domain box. If your domain name is available, it will notify you, otherwise you’ll need to enter in a different name. Account Plan: Choose an option that best suits your budget. Generally, the more months you pay in advance, the cheaper will end up being. Make sure to uncheck Domain Privacy Protection, Site Backup Pro, SiteLock Domain Security and Search Engine Jumpstart like the screenshot below. They are extra features that you don’t need. Once you’ve made payment, you’ll be provided with instructions to login to your web hosting control panel. You’ll then be able to move on to the next step. On the next page, click the Install button to start the installation process. 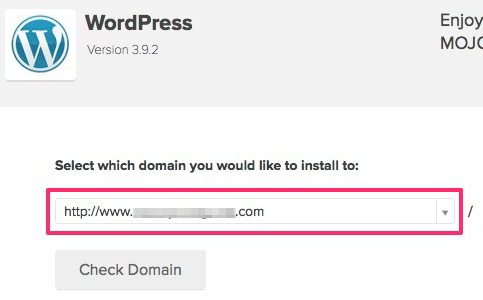 It will ask you which domain you would like to install to, there should only be one which you just registered for. Select it. Choose Show advanced options to bring the advanced options down. Feel free to name your blog, give it a username and password. 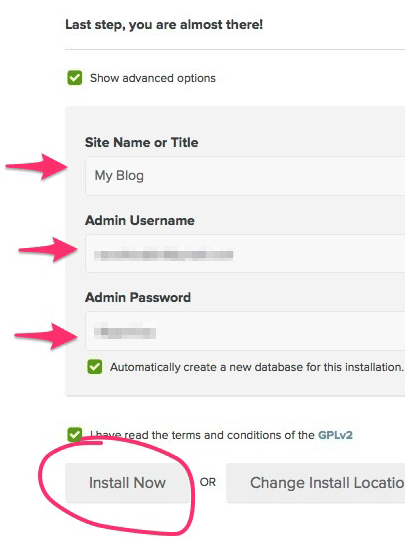 Note: You can change all these settings in blog control panel later on as well. Click the Install Now button once done. Once completed, the installation process will show that it has been completed. Click the View Credentials button. Where it shows the Alert, click the View button to view your login details for the blog. Keep the details handy and save it for future references. 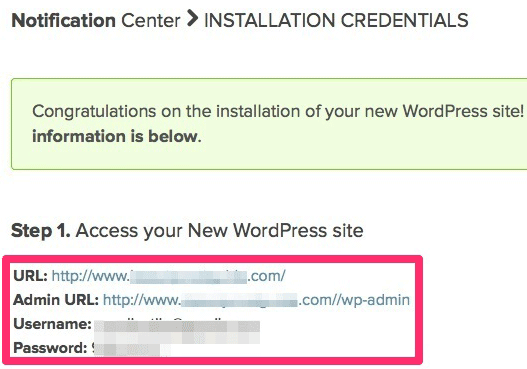 Login to your new WordPress blog using the credentials. You’ll see your blog dashboard. Posts: This is where you can post blog posts. Pages: Pages are considered more “static” which are pages like the About and Contact pages. 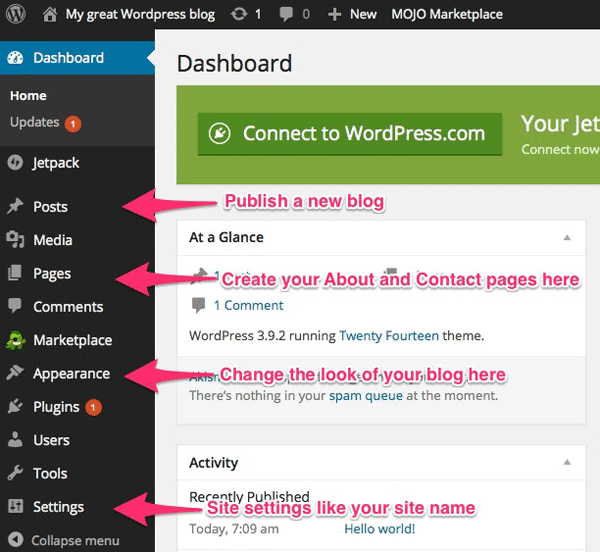 Appearance: You can change the look of your blog with different themes and templates. Settings: Change the name of your site and other general settings here. Plugins: Install all sorts of plug-ins to enhance your blog. Now that you have your blog installed, the next thing is how do you start blogging? Writing can be hard, especially if you don’t know what to write about. Since you only just started your blog, it’s a good time to introduce yourself – who you are, how you got started and what you plan on sharing on your blog. Give readers an idea as to what sort of blogs to expect. Start by adding a new post. On the left menu, go to Posts then to Add New. Enter a blog headline. Here’s 40 headline templates to get your started. 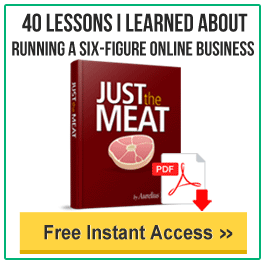 Now it’s time to add the meat of your blog post! Here are some of the basic formatting tools and some content that I added as a “Welcome” introduction. Preview or publish your post! On the right-hand side, you’ll find options for publishing your post. Preview the post to see what it looks like. Publish the post once you’re done. You can always edit the post afterwards. Simply head to your main homepage see what it looks like. Tell Your Friends About Your New Blog! Now that your blog’s live, it’s time to spread the word. Start by sharing your blog to your social media profiles such as Facebook, Instagram and Twitter. As easy and as fast as that, you’ll have your very own blog that’s ready for people to see. You’ll never have to worry how to start a blog. There are more advanced features of WordPress and so much more I could share but what I laid out in this guide is all you need to get your blog up and running. In no time, you’ll have a successful blog!